As we mentioned this morning, Animal Crossing Pocket Camp is now available on the Australian App Store (and Google Play). If you’re willing to jump through a few hoops to get an Australian iTunes account, you can very easily download the game and start playing right now. There’s one tiny caveat: The extent of Nintendo region locking this soft launch is limited to making sure your Nintendo account country is Australia. This is super-simple to change, you just log into My Nintendo, edit your profile, and you’ll be ready to rock. (It seems like once you’re set up you can switch it back to the USA without issue too.) After those few minor speed bumps I was on my way in Animal Crossing Pocket Camp, which has turned out to be a surprisingly competent miniature version of Animal Crossing with seemingly minor (and largely expected) freemium trimmings attached to it. After a quick character creation process where you select things like your gender, hair, eyes, and similar things the game teaches you how to move around and interact with the world. It’s all done through a super-simple tap to move mechanic, and like most tap to move games, you can also just keep your finger on the screen in the direction you want to move to continue heading that way. Interacting with the game world to talk to other characters, fish, shake fruit from trees, and everything else is as simple as just tapping on the thing you want to do. One design choice that I’m sure will be needlessly controversial is the various timers in the game. When you shake a fruit tree there’s a three hour timer before the fruit respawns. 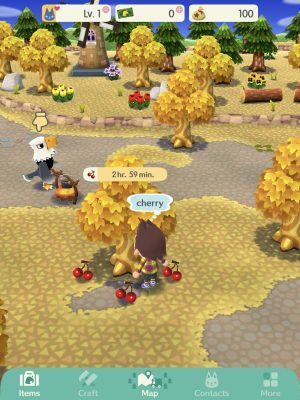 Ordering furniture (or, crafting, more accurately) also has an associated timer, and other characters rotate in and out of your Pocket Camp on a three hour timer. It’s easy to look at this and be like, “Argh I knew Nintendo was going to ruin Animal Crossing on mobile!!!" However, when you really think about it, Animal Crossing has always been a freemium style game- You just paid anywhere between $40 to $60 for it. On the 3DS in Animal Crossing New Leaf, you shook your trees to get fruit and it’d eventually regrow over time. You could order furniture from Tom Nook and it’d also take time to arrive. The difference is, the timers for all the actions you’d take in a “real" Animal Crossing game is largely hidden from the player and accepted as part of the gameplay of an AC title. Pocket Camp is really no different, they just show you these timers and give you the option to pay money to skip them. If you want to play Pocket Camp like you would any other Animal Crossing title in the past, so far it seems like you can effectively just ignore all this junk and play it the same way you did New Leaf, by just checking in every day or so. With many of the core concepts remaining the same, there’s still a bunch of notable differences in Pocket Camp compared to Animal Crossing games of the past. The most obvious new thing is instead of having a home in a town filled with characters, you’ve got a camp site you manage. Your camp has two “sections," an “indoor" area with weird flooring on the ground and an outdoor grassy area. Behind those is your tent where your character sleeps, which can be upgraded over time. Instead of having permanent villagers, other characters wander through the different locales surrounding your camp on a real-time three hour clock. Each character you meet has their own associated heart level with you, which really just indicates how much stuff you’ve done for (and with) them. 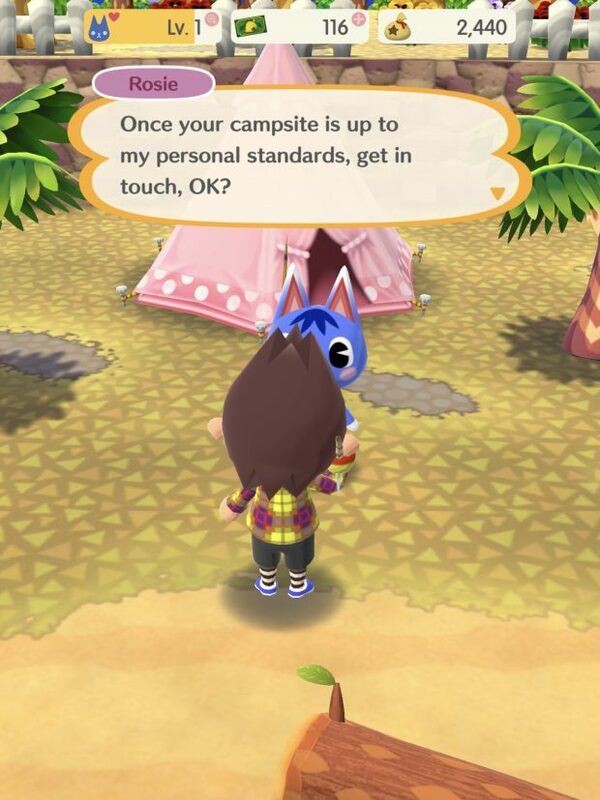 Characters will want to do things like have you bring them something, just chat for a while, and of course they’ll want to get invited to your camp site. The first two things are fairly expected and self explanatory, but the camp invitation introduces a new (and fairly silly) mechanic into the mix: Characters will only come hang out at your camp if you have the furniture they like. I understand it’s the gameplay mechanic that Nintendo chose to keep you chasing materials to craft new furniture, but the practicality of the exchange is sort of hilarious. 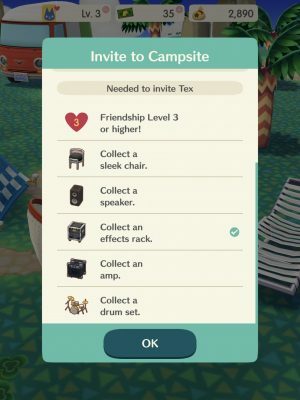 Can you imagine camping, running into someone while you’re going fishing, then being like, “Hey, you’re a cool person, do you want to come hang out at my camp?" …Only for them to respond something along the lines of, “You know, I would, but first you need to go buy this very specific chair for me to sit in and surround it with these other very specific items which might take you multiple real-world days to both gather the materials for and craft." That is precisely what Pocket Camp characters will have you do, and unlike the real world, there’s no “Screw off, I’m not buying an electric guitar just so you can come to my camp, I don’t even know you" button. As silly as all this is, it’s a big part of the game as building relationships with other characters and collecting more pieces of furniture is heavily tied in with overall progression. Speaking of crafting furniture, the other limiting factor you hit fairly easily is the same as the limits in New Leaf of only being able to order so many things from Tom Nook (or Cyrus, in this game) at once: Initially, you only have one “slot" for crafting furniture. If you want to build a couch that takes five minutes to make, you can’t build another piece of furniture until that timer has finished. Two other crafting slots are available, and they’re each unlocked by spending 80 Leaf Tickets, which are the premium currency of the game. Initially I looked at this and was like, “Alright, this is where Nintendo is turning the freemium screws," as in games like Clash of Clans, unlocking additional builders is a huge early pinch point that gets players to spend. Thankfully, this particular pinch is in appearance only as you easily earn way more than 160 Leaf Tickets just by completing basic objectives in your first session of the game. 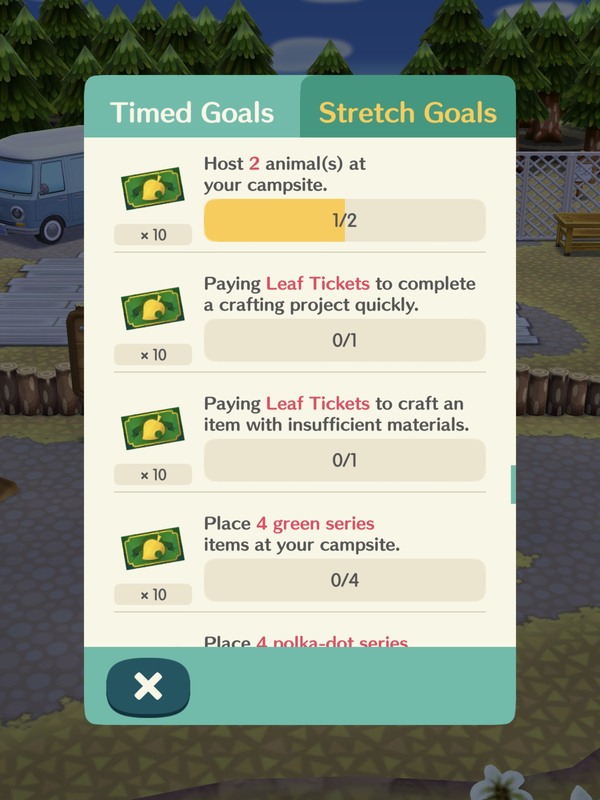 You can also spend Leaf Tickets to craft any furniture you might not have the materials for, but again, the first session of the game sprays so many of these different things at you that you’re really going to need to play the game for a while before you’re running low on anything. There’s other “cheater" items (and I’m saying “cheater" with the absolute most exaggerated air quotes imaginable) that you can buy with Leaf Tickets too like fishing nets and honey, which are used to catch loads of fish or bugs in one go- But, it seemed like if I wanted to invest the time I could just fish and catch bugs all day, so this seems like a real weird way to spend premium currency. 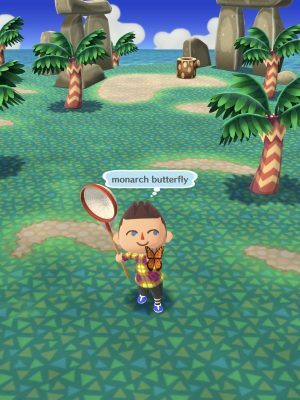 Speaking of fishing and bug catching, like New Leaf, those seem to be the primary idle activities you can do while you’re waiting for other things to happen. There’s a beach and a river you can visit to fish, and an island filled with bugs. Both fishing and bug catching are done through super simple taps, and by rotating through the beach, the island, and the river by the time you head back to the beach there will be all new fish spawns to farm up. Curiously absent so far is a watering can to water flowers, or any indication that you can plant anything on your camp site. Without trees you can plant, there also doesn’t seem to be an axe to chop them down. The way the shovel is implemented is the strangest thing I’ve come across, as you can only use it in the quarry to break rocks and accessing the query requires either spending 20 Leaf Tickets or getting five of your in-game friends to help you get there. This asking friends for assistance mechanic reminds me a lot of ancient Facebook games where you (for instance) might be stuck on an upgrade until you get X friends to join in and click to help you. If mining up minerals from the quarry becomes a thing that’s really necessary for high-level play, I’m sure there will be entire online groups dedicated to just spamming invites and help requests to each other, so I doubt this will be much issue. In my first session of the game, it wasn’t even really clear what these things are used for, but it seems safe to assume it has something to do with crafting. Aside from placating non-player characters, you’ll also run into actual players in the game world. They’re just randomly standing there, and by talking to them you can view their Market Box where you can see what items they have for sale (You also have a Market Box where you can list things.) or you can visit their camp site and give them “kudos" on their decorations. With the game being so new, everyone’s camp site I’ve come across largely looks the same but I imagine there will be some real interesting variety inside of the next couple of days. Instead of having a proper house that you’re eternally upgrading and paying for, Pocket Camp has you working on your camper. By visiting OK Motors on the map you can do things like get different paint jobs for the exterior, as well as upgrade how much room you have inside. 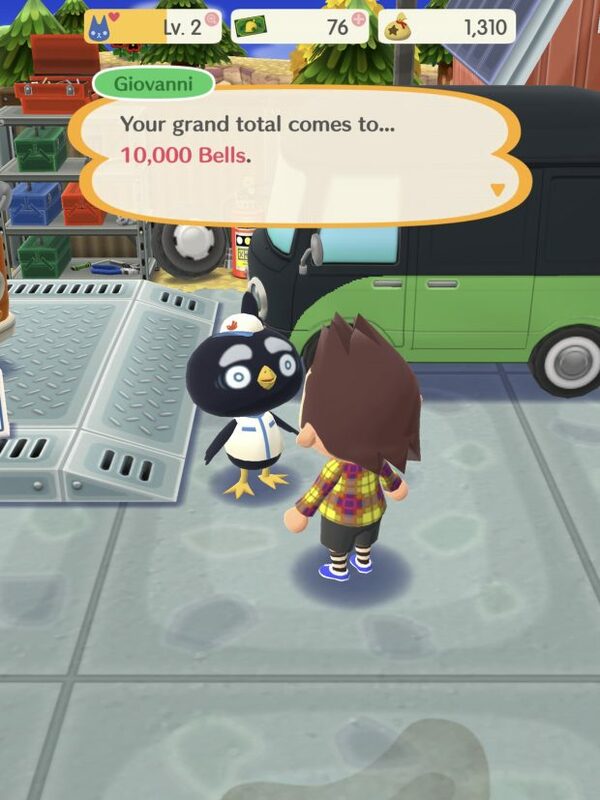 Of course, each upgrade comes with its own loan you’ll need to repay, with the first being a cool 10,000 bells. The Market Place is home to clothes you can buy and furniture you can directly purchase without needing to craft it, and this doesn’t seem to rotate on the same three hour clock. It seems safe to assume that like other Animal Crossing games the things for sale change daily, but I’m not super sure on that just yet. Overall, I’m very impressed with Animal Crossing Pocket Camp. This game feels like what Miitomo should have been, as it seems like it scratches a lot of those same online social game itches but in a way that’s actually meaningful with some form of progression. I’m excited to see more people to start playing the game as I feel like once I start diving into the friends system everything is going to get a lot more compelling. It’s obvious what Nintendo is shooting for here is a free (with very optional IAP) super lightweight version of Animal Crossing. If you really want to get into the Animal Crossing universe, it seems hard to imagine many people recommending Pocket Camp over a game like New Leaf, but I suspect the entire purpose of this game is to show folks who have never experienced Animal Crossing how much fun the gameplay formula is. If those folks end up loving it enough to consider buying a 3DS and New Leaf, the game has done its job. Similarly, it’s a version of Animal Crossing that goes with you everywhere, so even if you’re hard and heavy into New Leaf, you likely don’t have your 3DS with you everywhere you go like you do your iPhone. 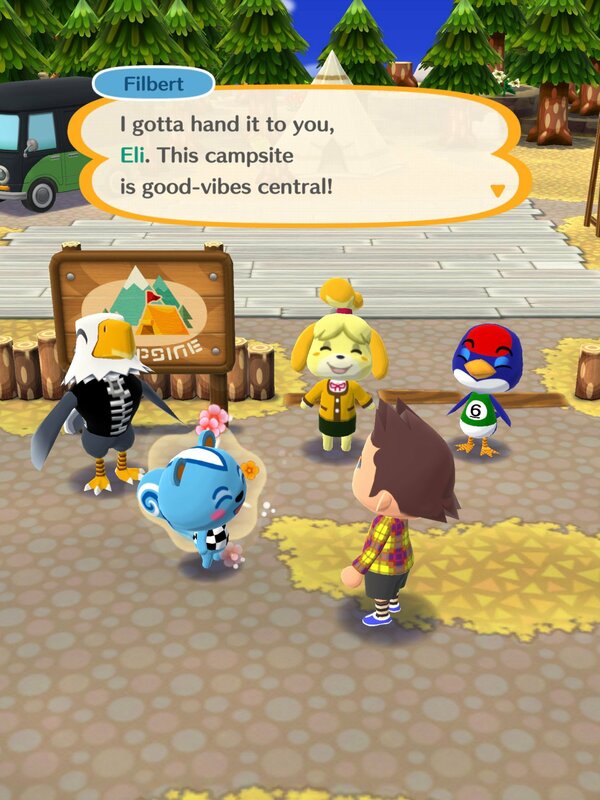 There also seems to be loads of potential with different seasonal events and other things, so, we’ll see how good of a job Nintendo does at running Pocket Camp. The game is built in a super modular way in that they could continue to add destinations to the map infinitely, so there’s loads of potential here to get players supremely deep into Animal Crossing. Animal Crossing Pocket Camp will launch globally in late November, so you won’t have to wait very long to be indebted to the tune of thousands of bells for a never-ending chain of camper upgrades and camp site tinkering.